Is it breakfast, brunch or dessert? 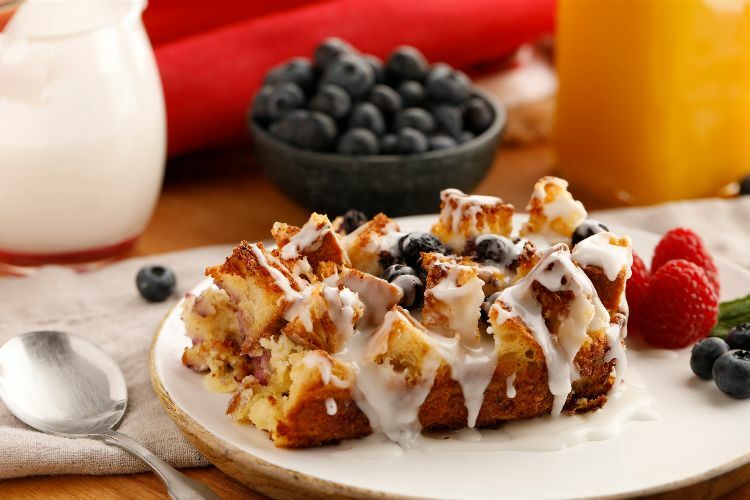 Because this dish crunches like toast, tastes rich like bread pudding and is oh-so-sweet, you may not be able to tell! But when you make the recipe that follows, you'll know one thing for sure – it is truly delicious. In addition, it's pretty enough to serve as a centerpiece for any table setting. Those who don't love bread pudding will be happy to know that although the recipe includes bread, t doesn't turn to complete mush. Just enough of it is left out of the custard mixture that little bits and pieces stick out. As those pieces cook, it will turn them crunchy and crispy, providing all the texture you need. The cream cheese and the blueberries chime in perfectly with their delicious flavors to top off the dish no matter when you serve it. Grease the bottom and sides of a 9--by-13 casserole dish with the melted butter and preheat the oven to 350 degrees F.
Place half of the bread into the greased casserole dish and set aside. Place the cream cheese, 2 tablespoons of sugar and lemon juice in a medium bowl. Stir until smooth. Drop the cream cheese mixture by spoonfuls onto the bread pieces and scatter half of the blueberries over top. 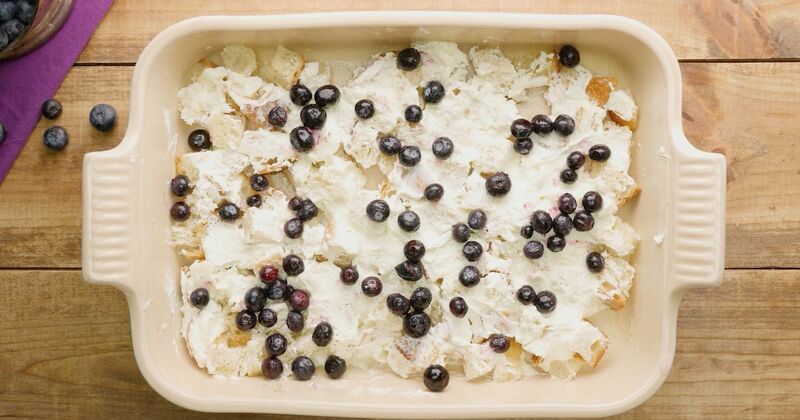 Top the casserole with the remaining bread pieces and then the remaining blueberries. Add the eggs, milk, cream, remaining 1/2 cup sugar, vanilla and lemon zest into a large bowl and whisk to combine. Pour this mixture over the bread. Place the casserole into the oven and bake for 50 minutes, until the casserole is set and a knife inserted into the middle comes out clean. Let the casserole sit for 10 minutes before slicing and serving.